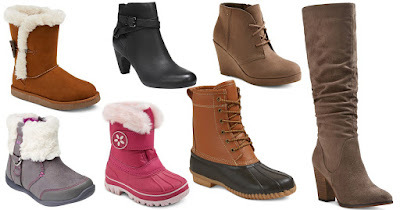 The Frugal Family Life: Target :: Up to 60% off Women's and Girls Boots! Hurry over to Target.com where you can save up to 60% off select Women’s and/or Girls’ Boots with many boots starting starting in price at just $14.99-$19.99! If you're still in need of some boots...or let's face it...you just want some, this is a great price! You may be able to opt for free in-store pickup if available near you; otherwise, shipping is free on orders of $25 or more.